Two couples share the stories of their low-key, intimate wedding ceremonies held right here in Saratoga Springs. As a Syrian American, I’m familiar with what many Syrians joke is the traditional Arab wedding mantra: “Go big or go home.” Last November, I was lucky to attend a beautiful Palestinian wedding reception that lived up to this expectation, with its delicious halal buffet, catchy Arabic tunes that got everybody (except my dad, despite his friends’ best efforts) out on the dancefloor and a performance by a group of professional dabke dancers, who did a traditional Arab dance and invited the event’s bravest attendees to jump in (I watched from the sidelines). On the drive home, I listened to my parents reminisce about their own wedding, which was far from traditional: They had an intimate religious ceremony with their siblings’ families as witnesses, followed by a secular multicultural reception where, legend has it, my American mother got my Syrian father to dance the “Electric Slide” for the first time. The way I see it, a couple’s wedding should reflect their own personal wishes for their own special day. 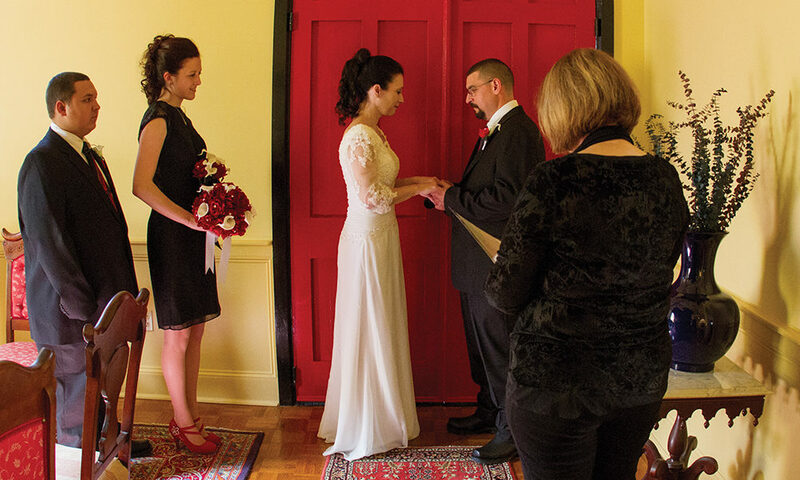 Reverend Joy Burke, an interfaith minister based in Saratoga Springs, agrees, having officiated around 1000 personalized weddings (she even offers the front room of her house—a former church—as an elegant venue for couples wanting an intimate, classy elopement ceremony). Anne and Michael Payette, who live about an hour west of Saratoga in Montgomery County, eloped on February 27, 2016, and chose Reverend Burke’s home as their venue because of its “close to home” feel. “It wasn’t the first marriage for either of us, and we strongly felt that it was important to focus on the meaning of the day, between the two of us, rather than the distraction of having a larger wedding,” Anne says. “We wanted to experience the moment in our way, in our time and be able to focus on each other first and foremost.” True to their vision, the Payettes’ wedding was made even more special by the presence of their grown children, who served as their witnesses. Afterward, the couple celebrated with a photoshoot in Congress Park and an intimate dinner gathering in their hotel suite, complete with cake and champagne (served in custom-made champagne flutes). They’re planning on renewing their vows in the future, in the same way. It turns out that Reverend Burke has also officiated at a rock star elopement (yes, there is such a thing). When Susan Gabrels and her husband Reeves, who’s a guitarist in the British rock band The Cure and was David Bowie’s guitarist for more than a decade, chose to get married in Burke’s front room, they’d already been together for 12 years. Their elopement took place on January 28, 2018, and was an equally personal and family-oriented event, with Susan’s daughter, son-in-law and brother serving as witnesses (Saratoga is an important place in Susan’s family history, because her relatives lived in nearby Stillwater for three generations before relocating to Troy, where she and Reeves now reside). “It felt like we were going somewhere special but close to home,” Susan says. Eloping also eased the burden of scheduling a wedding amidst their busy social schedules and work obligations—and eliminated the logistical nightmare of having friends and relatives travel from all over the world to attend their impending nuptials. (Susan affectionately calls their elopement a “manageable, meaningful minimum.”) To complement their small ceremony, the Gabrelses traveled to New York City, Georgia, South Carolina and as far off as England throughout 2018 to celebrate with different groups of friends. Their first post-wedding celebration was an English High Tea at The Adelphi Hotel, complete with traditional sandwiches, desserts and champagne. I can’t think of anything more British, rock ’n’ roll or Saratoga. Manageable, meaningful minimum indeed. Sarah Midani is a senior at Siena College, completing her BA in English. She's worked as an Editorial Assistant at saratoga living and is now a Contributing Writer.